Toolbars are usually used to group some number of widgets in order to simplify customization of their look and layout. Typically a toolbar consists of buttons with icons, labels and tooltips, but any other widget can also be put inside a toolbar. Finally, items can be arranged horizontally or vertically and buttons can be displayed with icons, labels, or both. Where orientation is one of ORIENTATION_HORIZONTAL or ORIENTATION_VERTICAL. The style is used to set appearance of the toolbar items by using one of TOOLBAR_ICONS, TOOLBAR_TEXT, or TOOLBAR_BOTH. The enable argument is either TRUE or FALSE. The above beginning seems should be familiar to you if it's not your first PyGTK program. There is one additional thing though, we import a nice XPM picture (gtk.xpm)to serve as an icon for all of the buttons. Line 10 starts the ToolbarExample class and lines 12-14 define the callback method which will terminate the program. Lines 19-30 are two callback methods that will be called when one of the buttons on a toolbar is pressed. You should already be familiar with things like this if you've already used toggle buttons (and radio buttons). The above should be similar to any other PyGTK application. Just initialization of a ToolbarExample object instance creating the window, etc. There is only one thing that probably needs some explanation: a handle box. A handle box is just another box that can be used to pack widgets in to. The difference between it and typical boxes is that it can be detached from a parent window (or, in fact, the handle box remains in the parent, but it is reduced to a very small rectangle, while all of its contents are reparented to a new freely floating window). It is usually nice to have a detachable toolbar, so these two widgets occur together quite often. Well, what we do above is just a straightforward initialization of the toolbar widget. In the above code you see the simplest case: adding a button to toolbar. Just before appending a new item, we have to construct an image widget to serve as an icon for this item; this step will have to be repeated for each new item. Just after the item we also add a space, so the following items will not touch each other. As you see the append_item() method returns a reference to our newly created button widget, so that we can work with it in the normal way. Here we begin creating a radio buttons group. To do this we use the append_element() method. 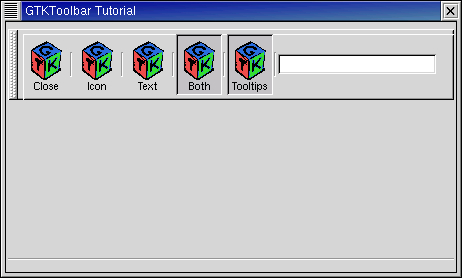 In fact, using this method one can also add simple items or even spaces (type = gtk.TOOLBAR_CHILD_SPACE or gtk.TOOLBAR_CHILD_BUTTON). In the above case we start creating a radio group. In creating other radio buttons for this group a reference to the previous button in the group is required, so that a list of buttons can be easily constructed (see Section 6.4, “Radio Buttons” earlier in this tutorial). We also save a reference to the button in the ToolbarExample instance for later access. We create the other radiobuttons the same way except we pass one of the created radio group buttons to the append_element() method to specify the radio group. In the end we have to set the state of one of the buttons manually (otherwise they all stay in active state, preventing us from switching between them). A toggle button can be created in the obvious way (if one knows how to create radio buttons already). As you see, adding any kind of widget to a toolbar is simple. The one thing you have to remember is that this widget must be shown manually (contrary to items which will be shown together with the toolbar). 139           # that's it ! let's show everything. 145       # rest in gtk_main and wait for the fun to begin!